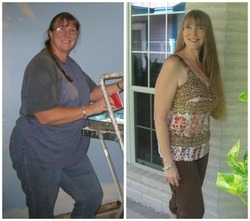 After a trip to the hospital, and a final warning from her doctor, Danielle committed herself to a healthier lifestyle. She knew she needed a plan that she could maintain, so before making changes to her diet or exercise, she asked herself, “Can I eat/do this for the rest of my life?” Now, at over 80 lbs. lost, and almost to her goal weight, Danielle is happier and healthier than ever. In December of 2011, I ended up in the hospital for 3 days due to cardiac issues. My cardiologist came into my room, looked at my chart, then looked me in the eye and said, “Well I have told you to lose weight three times now.” I never thought he was serious about me losing weight. I just thought it was something they tell any patient that is even a little overweight. Turns out I was wrong…almost dead wrong! It took blacking out in my kitchen and a nice long stay at the hospital for it to finally sink in. I started my journey that moment. Weight Watchers online, Atkins, many different types of “appetite suppressant” pills, grapefruit diet, fasting, the juice diet, fat-free diet, and I almost went through with a surgical-banding procedure. Rock climbing may burn an enormous amount of calories, but if you don’t enjoy it then it’s only temporary. If I can’t do without a certain food, then I try to find a low calorie substitute for it, or I have it but I try to cut back on the amount of that food. When I wanted to track my calories in a more organized way, I found Calorie Count online. Calorie Count has been absolutely instrumental in my weight loss! Counting my calories keeps me aware of what, and how much, is going in my mouth! I love the support I receive from my fellow CC’ers. The charts and tools that Calorie Count offers have been vital in my weight loss. Some people “sabotaging” me, i.e., “Let’s go out to eat,” and “Here is your favorite pie, I made it just for you!” “Come have a drink with me after work.” I have even had people tell me that “You look better heavier.” and, “I think you should stop losing weight, you look good right now.” I have had to be more considerate of my spouse and friends because they seem to be afraid that my weight loss is going to change our relationship somehow. They are right to an extent; I will no longer be the “fat one” in the dynamic. The first change I noticed was after about 3 months of dieting, I suddenly got my balance back. I could now stand to put on my pants, before I would have to sit down and put my pants on, or I would have to lean on my dresser to not fall over. Other people started noticing my weight loss after losing about 40 pounds. I really didn’t feel much different at that time. I have 10 pounds to lose before reaching my goal weight, after I do that I have the challenge of maintaining. If I can maintain my weight loss then I will consider myself a success! Occasionally, I have an out-of-control eating day. To keep these kinds of days at a minimum, I make sure that I eat on schedule, I do not skip meals. I keep snacks in my purse in case I get caught away from home at meal time. I stay hydrated because sometimes I will think I am hungry when it’s only thirst. I don’t let myself get bored, because boredom is the number one reason that kicks off an eating binge. I have more energy! My husband says things like “I’ve got my old girl back,” and, “You look so much younger.” I can shop in just about any clothing store now. I can wear a size 8 now. I feel prettier, and I no longer have to take blood pressure medication. I don’t have as many heart palpitations; I can walk around without losing my breath. My thighs don’t rub together when I walk. My saggy, droopy belly is gone. My husband, sister, and mother have all been inspired to lose weight too! I am a much happier and healthier person! Approximately six months at my current weight, but still losing! 2. Don’t eat in the three hours before you go to sleep. 4. Watching TV can be your downfall. Set a particular amount of time you want to watch before turning the television on, and when that time is up….SHUT IT OFF! 5. Get a full night’s sleep! Do not cut yourself short on this. Stacey has made an amazing transformation and now maintains a healthy 120 lbs!